President Mugabe has bemoaned the low number of women enrolling for gruelling military officer cadet training. He was speaking at the commissioning of 188 cadets who included personnel from the army and air force at the Zimbabwe Military Academy in Gweru yesterday. �The Zimbabwe Military Academy Cadet Course commenced on 17 September 2012 with an initial enrolment of 293 students comprising 188 Zimbabweans and five Namibians. Obviously, there was no gender balance at enrolment when out of the enrolling 183 students, only 22 were female,� President Mugabe said. The selection process was aimed at achieving equal representation from all of Zimbabwe�s 10 provinces and from serving members of the Zimbabwe National Army and Air Force of Zimbabwe. �From the initial enrolment, 45 males and five females failed to meet the gruelling demands and rigours of the course. They were, therefore, duly withdrawn from the course. Meanwhile, three students from this course, nominated for further studies in the People�s Republic of China, though in absentia, are also being commissioned today,� President Mugabe said. One officer cadet, Vitalis Zenda, died during training. President Mugabe noted that the graduation of five Namibians showed the cordial relations existing between Harare and Windhoek. �I am pleased that five students from the Namibian Defence Forces being commissioned today are the third group to be trained here by the Zimbabwe Military Academy. This demonstrates the strong bilateral ties that exist between our two defence forces and indeed our two countries,� he said. 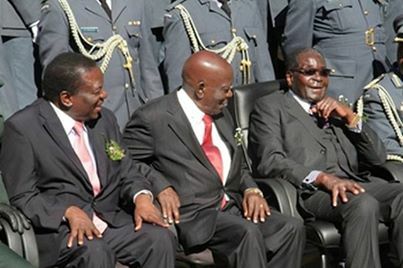 President Mugabe also hailed the relationship between the Zimbabwe Military Academy and Midlands State University. �I am reliably informed that this is the fourth Officer Cadet Course to graduate with a Military Training and Education Diploma, which is accredited by the Midlands State University, to which the ZMA is affiliated. Active arrangements are in place for officer cadets from this academy to study for degree programmes with the MSU,� he said. Among the graduands were 41 AFZ officers who underwent the Joint Training Pilot and Regular Officer Cadet Course Number 67. Zimbabwe Military Academy. This demonstrates the strong bilateral ties that exist between our two defence forces and indeed our two countries,� he said. �I am reliably informed that this is the fourth Officer Cadet Course to graduate with a Military Training and Education Diploma, which is accredited by the Midlands State University, to which the ZMA is affiliated. �Active arrangements are in place for officer cadets from this academy to study for degree programmes with the MSU,� he said.